When navigating, it often occurs that we are going to follow some specific course but the vessel goes in some other direction. This is called drift. 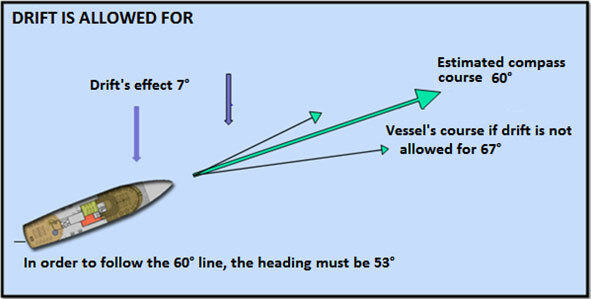 Wind and tidal currents have influence on the vessel’s course. Course made good is when the effect of currents is allowed for. Course sailed is the course of the vessel based on a map. Course sailed is also the course which the vessel’s keel lies in. Drifts’s effect on navigation, wind allowed for. 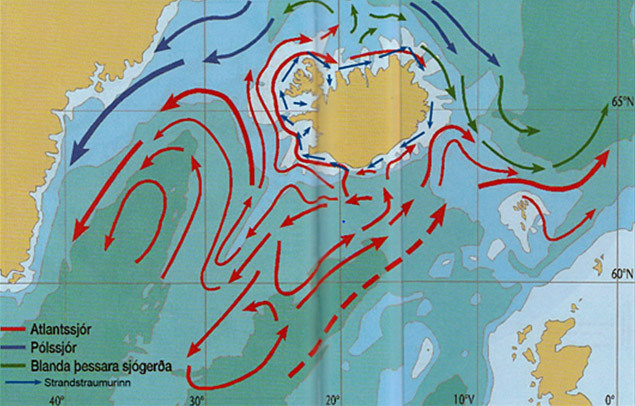 The dark blue arrows show the course of the tidal current clockwise around Iceland. The red arrows show how waters from the Atlantic Ocean go around the land and the North Atlantic. The blue arrows show the course of polar waters in the North Atlantic. The green arrows show the course of a mix of these waters in the North Atlantic.